This treatment uses your own platelets to trigger new collagen production, resulting in tighter, smoother and younger-looking skin. One of the main advantages of this procedure is that there is no risk for allergic reaction because it uses your own blood. PRP Facial is a highly effective treatment for both men and women with little to no side effects. This cosmetic medical procedure can be broken down into three steps. First, the treatment starts with simply drawing some blood from the patient, usually just a couple of vials of blood from your arm, which then are placed into a centrifuge. This device is key as it separates the plasma and platelets from the red blood cells. The platelets are activated to initiate the release of growth factors that promote tissue repair or regeneration and promote healing. PRP stimulates stem cells to improve quality of skin tone and texture by regenerating new capillaries to feed the skin, as well as thicken skin to reverse the thinning which occurs as part of the aging process. Hair loss: PRP can be injected into the scalp to promote hair growth and prevent hair loss. PRP injections are effective in treating androgenic alopecia, which is also known as male pattern baldness. Skin: PRP helps diminish the effects of aging as well as triggering the release of growth factors and forcing the skin into a regenerative state. It can decrease scarring that may have resulted from acne, surgical scars, burns or keloids. Tendon injuries: Tendons are tough, thick bands of tissue that connect muscle to bone. They are usually slow to heal after injury. PRP injections are used to treat chronic tendon problems, such as tennis elbow, achilles tendonitis . Acute injuries: PRP injections are used to treat acute sports injuries, such as pulled hamstring muscles or knee sprains. Postsurgical repair: Sometimes doctors use PRP injections after surgery to repair a torn tendon or ligaments. Osteoarthritis: Doctors have injected PRP into the knees of people with osteoarthritis. 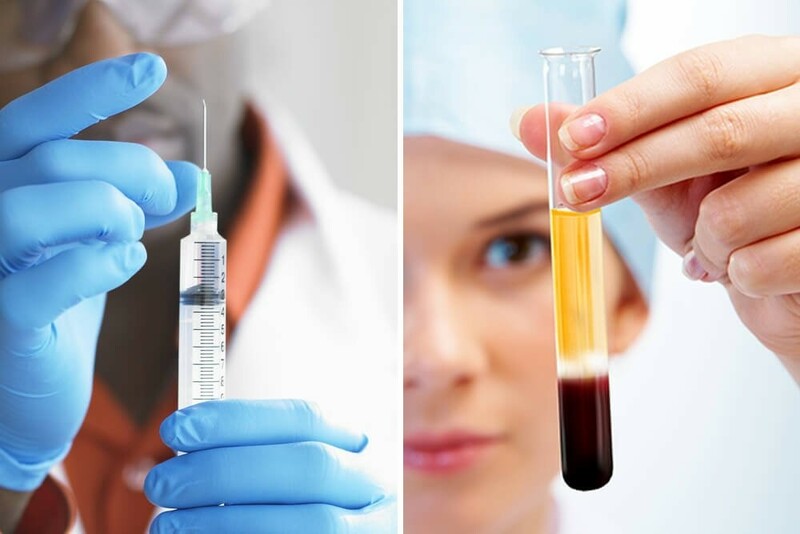 A 2015 study found that PRP injections were more effective than hyaluronic acid injections (a traditional therapy) for treating osteoarthritis. WHAT IS A VAMPIRE FACIAL VS VAMPIRE FACELIFT? A PRP/Blood Facial is a natural non-surgical, minimally invasive option to help diminish the effects of aging as well as triggering the release of growth factors and forcing the skin into a regenerative state. It can decrease scarring that may have resulted from acne, surgical scars, burns or keloids. This cosmetic medical procedure can be broken down into three steps. First, the treatment starts with simply drawing some blood from the patient, usually just a couple of vials of blood from your arm, which then are placed into a centrifuge. This device is key as it separates the plasma and platelets from the red blood cells. Next, we use a micro-needling or Dermapen device to create micro-injuries to the skin which initiates the healing cascade whereby special cells called fibroblasts are stimulated to rejuvenate the skin by producing collagen. Lastly, we then apply the PRP serum onto the skin so that the stem cells contained in the serum can work to communicate with the stem cells of the skin, a cell to cell communication, to further enhance the release of growth factors. Release of growth factors in the skin is also a result of the micro-needling treatment. The PRP serum acts as a booster to enhance the effects of micro-needling. The redness and scratched looking appearance may last for 1-3 days. Once the redness resolves, the tightening and rejuvenation begins. Generally, with the Vampire Facial, treatments are needed 3-6 times about a month apart to achieve the best results initially. After which one-time touch-ups are recommended to maintain the effects. Our Vampire Facelift is a combination of Restalyne Skinboosters (Hyaluronic Acid) and PRP Injections. Hyaluronic Acid (HA), which is a hydration agent naturally occurring in our body capable of drawing 1000 times its molecular weight in water to itself. This is why HA is such a great skin volumizer and moisturiser. HA is delivered into the skin by the injector to provide a scaffold-like structural upon which the PRP matrix will work to activate the surrounding stem cells of the skin to produce fibroblasts which will build collagen, increase fat cells to further plump the skin and develop an enhanced circulatory network to restore the natural glow of youthfulness.